Generally, I manage to refrain and avoid purchasing things that have peanuts in because having a blotchy swollen face is not exactly one for the yearly photo album but sometimes I just really really realllyyyy want some peanut joy in my life. When that happens I end up buying things like this Dairy Milk Big Taste Peanut Caramel Crisp chocolate bar. The appearance of this bar, when you encounter it on the shelves is nothing special, and even the big bold wording on the side does not really attract your attention that much but I have found this increasingly with Dairy Milk bars and how they have not raised above the competition of similarly packaged Milka bars. The bobbling texture of the bar inside is somewhat obvious as the packaging does not sit flat and evenly despite being carefully placed in a box on a shelf and it really brings down the expectations on the quality of the product. Whilst if they had made the packaging a little tighter it could have ended up in the odd raised bit of the bar from being crushed I do not think it would have made a huge amount of difference and instead potentially increased the sales of it on the shelf because of it at least looking up to usual Dairy Milk packaging standards. The top of each square really does look great and I appreciate the efforts to give the impression of it being packed with peanut and reverting to the peanut shell to express that rather than in the uncased version that so many people would be used to. Seeing the shells brings some nostalgia to me and reminds me of a time when we ended up with a huge bag of shells that needed sorting out to get the actual nut from within, a bit of a task but a fun one all the same. I feel that the design of the bar did have an impact on the chocolate itself and that it lacked that perfect usual chocolate shine; by no means was the chocolate dull or not prepared properly but it looked quite thin in some places and that had a noticeable impact on the glaze of the bar itself. For me the glaze and shine of a chocolate bar really makes a huge impact and it mentally gives me the impression of quality, which I acknowledge is ridiculous, but I really feel that the appearance of the bar itself also represents the general decline in quality and care from Dairy Milk that I have noticed over the last couple of years. Despite all the flaws in its appearance the bar actually passed the taste test and had a good balance between chocolate sweetness and peanut savoury flavour. 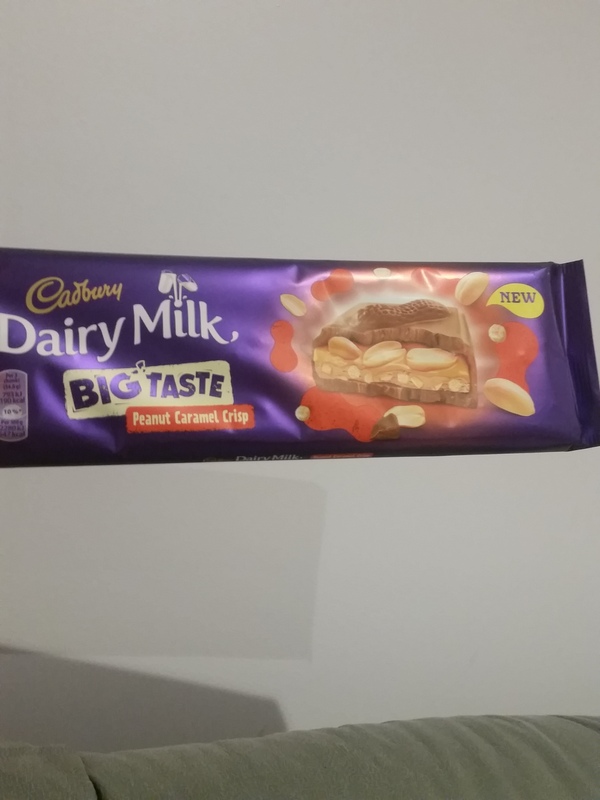 The peanut taste was noticeable but was not a really strong hit that further helped to create that balance to keep this as a sweet chocolate bar rather than verging onto a savoury treat. I did find a few issues with the texture and that it was a lot of crunch because of the amount of wafer and peanuts and there was nothing to really soften it up a little and as a result it was quite dry to eat, especially because as mentioned the chocolate seemed to be thinner than normal so did not really melt in the mouth to add that softer texture, and that did disappoint me a little. Whilst this did hit the peanut craving spot I do feel that there are better and cheaper alternatives available on the chocolate shelves in a supermarket and as a result this is not something that I would purchase again or recommend. People on Instagram have used these on top of things like porridge and overnight oats that they have then popped into the microwave to start melting each square down a little and that works quite well apparently but that is really not at all my scene so something that I have not at all considered trying with this particular bar. If you have given this bar a try I would love to know your thoughts in the comments below! This entry was posted in Food and Drink, Product Reviews and tagged allergy, brand, cadburys, chocolate, first impressions, food, food blog, food blogger, food bloggers, lblog, lblogger, lbloggers, life, Lifestyle, lifestyle blog, lifestyle blogger, lifestyle bloggers, peanut, peanuts, product review, review, taste test. Bookmark the permalink.